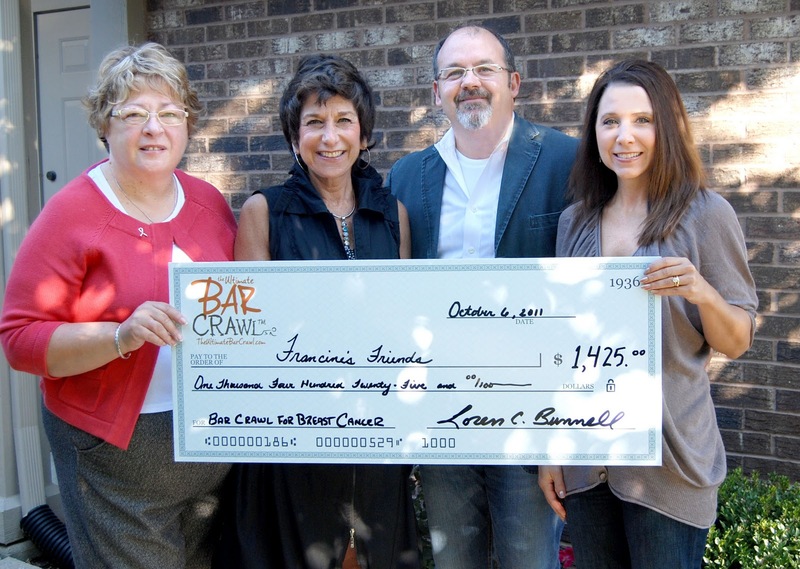 Francine's Friends loves it when our circle expands and that's exactly what happened recently when The Ultimate Bar Crawl, Inc. president Loren Bunnell called to let us know he was presenting us a donation! The first annual Downtown Fort Wayne Bar Crawl for Breast Cancer was held on Saturday, August 13th. Although the weather was soggy, the spirits of the nearly 200 who attended were not. Participating locations included Flashback on the Landing, Thirsty Camel, Columbia Street West, Champions Sports Bar & Restaurant, and JK O'Donnell's. "My mother was recently diagnosed," explained Bunnell, who started the Ultimate Bar Crawl here in Fort Wayne in 2010. "Our goal was to do something fun, while supporting a local charity." Participants checked in at the original downtown beer tent location on the Landing, received a t-shirt, an Ultimate Bar Crawl game card, and a map of participating bars. After dinner, "crawlers" visited each location, getting their cards punched at each stop — along with drink specials, no cover charges, and prizes and giveaways. "Most everyone came back to the tent at the end of the evening wet, but happy, and turned in their completed cards," said Annette Pearson, VP of Business Operations. Music by a DJ, more giveaways, and a drawing for six additional big-ticket prizes concluded the evening of fun — all for a good cause! The result? Bunnell and Pearson presented Francine's Friends — their local charity of choice for this event — with a check for $1,425.00! In addition to helping local charities and the armed forces, other "crawl" themes include birthdays, holidays, and other special occasions. Find out more by visiting www.TheUltimateBarCrawl.com. Thank you to Loren and Annette and all those who participated and donated!